We ended September with powerful Pluto turning back to direct motion at 18 degrees Capricorn, nudging us to reclaim our power! This month we will see a highlight of energies from Scorpio, the sign that Pluto rules, keeping the theme of empowerment going strong! But, first let us take a look at the Numerology Vibration for the month, before focusing on the astrological energies. October is a Universal 21/3 Month Vibration. The lower vibration of the 3 tells us that this will be a month of focusing on all that has to do with the mental body…..thoughts, ideas, and all forms of communication are highlighted. This is a good month for creative self-expression and expansion on all levels. The number 3 also is about our belief systems, so this month it will be important to pay attention to our thoughts about ourselves, about others, and about our life and where we would like to take our Path as we move forward. The 21st Major Arcana in the tarot is the World. This is the last of the Major Arcana cards and suggests that our souls and our planet, on a collective level, are at the end of an important cycle in our growth and evolution. This is a time for us to step out into the “world” and revel in our success. We have moved through a lot of lessons in the past few months, as Saturn, the Task Master is the ruler of this card, and it is now time to “graduate” towards some much-deserved blessings. Be confident and open to the new opportunities that present themselves now! The more positive that you feel and project out into the world, the more success that can be manifested! The first astrological energy of significance happens on October 2nd with Mercury, the Messenger, challenging Pluto, ruler the underworld. This may sound more ominous than it needs to be. With this connection, we have the ability to dig down deep and see what lies below the surface regarding situations and circumstances in our lives. Our perceptions and communications can be more intense now, and our interactions with others more revealing. 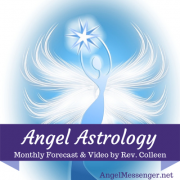 On October 5th lovely Venus turns to retrograde motion at 10 degrees Scorpio and retrogrades all the way back to 0 degrees by the end of the month. She will continue her backward movement into Libra until mid-November before turning back to direct motion and re-enter Scorpio in December where she stays until January 7th, 2019. Libra is the sign of partnerships and Scorpio rules shared resources, including finances, within those partnerships. So, we will see a focus of transformation within our relationships…..especially romantic and business. Venus desires love and harmony and Scorpio wants to merge and have power, so we may see certain situations becoming more intense, and/or some of our connections with others deepening and becoming more authentic and committed. Venus in Scorpio is serious when it comes to love and money! We have a New Moon at 15 degrees Libra on October 8th. 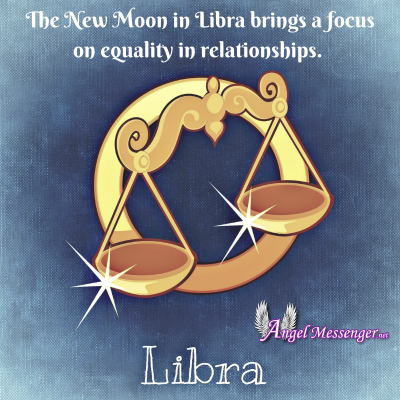 New Moons are about new beginnings and in the sign of Libra, there is a focus on equality in relationships. This lunation is challenging Saturn, Teacher of Lessons, positively connecting with Mars, planet of energy and action, and challenging Pluto, ruler of transformation and regeneration. It does sound as if we are in the process of moving through some intense karmic lessons in our connections with others, but there is support coming from Mars, the Warrior, to assist us in moving through these energies, if we so choose. On October 9th Mercury, ruler of the mental realm is moving into the sign of Scorpio! Our thoughts are deeper and our communications more intense for the next three weeks as he travels through the sign of the Scorpion. We are now more empathic and clairsentient, feeling other people’s emotions and reading the undertones of the energies within situations and circumstances around us. We must be mindful of clearing ourselves energetically so that outside influences are not affecting us and our mindset. There may also be a focus on plans, ideas, and communications that involve money and finances. The Scorpio emphasis continues with Mercury in Scorpio opposing Uranus, the Great Awakener, in Taurus on September 10th, connecting with Venus retrograde on the 15th, creating a positive connection to Neptune, ruler of the spiritual realm, in Pisces and challenging Mars, the Warrior, on September 19th. We also have Venus challenging Mars, and the Sun in a square aspect to Pluto, during this time. What does this all mean? There may be some frustrations in communications with others. However, this also supports sudden revelations! There could potentially be power and control issues with others and challenges in our relationships. Be mindful of your thoughts and words when speaking. They can have a great impact. It is important to speak your truth and own your power, but it can be done without fueling the fire, so to speak. 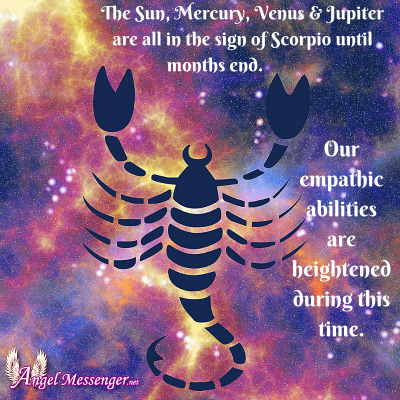 On October 23rd the Sun moves into Scorpio, so now we have Mercury, Venus, Jupiter, and the Sun all in this sign of the Scorpion. Energies can be intense now. Our empathic abilities are heightened. Scorpio rules power, secrets, research, death & rebirth, transformation, and transmutation. These four planets will be traveling through this sign together until the end of the month when Mercury and Venus make a sign change. Also on the 23rd, the Sun, newly in Scorpio, opposes Uranus retrograde in Taurus. This leads us up to the Full Moon in Taurus on October 24th. Full Moons bring energies to a heightened state and then a time of releasing and letting go. Two days after this Full Moon the Sun connects with Venus retrograde in Scorpio. With Uranus and Venus, both retrograde this intensifies the effect of the Sun opposing one (Uranus) and then conjuncting the other (Venus). So, this Full Moon is extra powerful, with sudden shifts and redirections, perhaps in the area of money and finances, taking place. This can bring positive surprises, but could also bring some shocking events as we never know what to expect from Uranus. On October 29th Mercury connects with Jupiter, expanding our ability to project our thoughts and ideas to others, and intensifying the tone and power of our conversations. Our intuitions and psychic perceptions are stronger now and situations involving power and power struggles may become more apparent. This is a time to empower ourselves within any circumstances where we may be feeling disempowered. 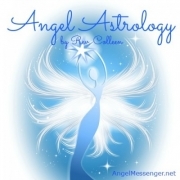 On the 31st, the last day of the month, Mercury, the Messenger, will move out of Scorpio and into the more inspirational and outspoken sign of Sagittarius where he will be until January 2019. He will spend an extra long time in this sign of the Archer because of his next retrograde cycle which will start in November. While Mercury is in fire sign Sagittarius, we start to expand our perceptions and look more at the big picture. We are also more motivated to learn new information through reading, taking classes, etc. and/or sharing information with others through teaching or just expressing our beliefs. Also on the 31st, Venus, ruler of relationships and finances, will oppose Uranus, planet of the unexpected, right before she retrogrades back into the sign in Libra. She remains in Libra, her home sign, until December 2nd before returning back to Scorpio. Here she has another opportunity to find the equality and balance that she desires in partnerships. She is all about love, harmony, and keeping the peace, but since she spent some time in Scorpio before retrograding back into Libra, she is not opposed to stand strong in her truth and empower herself to make the changes that she desires. The cards used for the main message in this reading are from the Sirian Starseed Tarot by Patricia Cori and Alyssa Bartha. For the special messages, Rev. 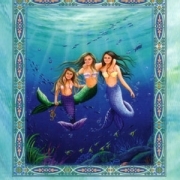 Colleen uses the Crystal Angels divination deck by Doreen Virtue.